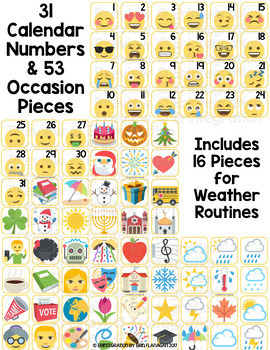 Emoji calendar numbers and bulletin board set! 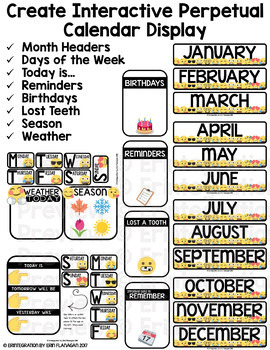 Calendar pieces to build a monthly and daily interactive calendar display. Fits most standard pocket charts or print & use velcro or magnets to display on a bulletin board or whiteboard. Includes pieces for a monthly display, editable special occasion cards, and daily calendar activities for morning routines. Each set comes in 3 styles that can be mixed and matched too! ★ PDF with numbered pieces for days of each month #1-31. Each features a unique Emoji face. 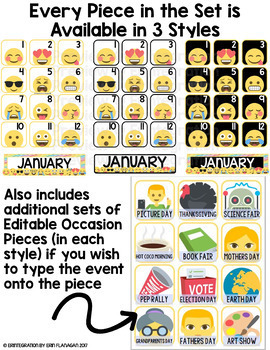 ★ 53 EDITABLE special occasion pieces for weather, events, and holidays - add your own text RIGHT in the PDF or use the included PowerPoint file to label the occasions as you see fit. ★ EDITABLE PowerPoint to write your own months, days, and text pieces - perfect if you wish to have a calendar in ANY language. ★ Weather display to attach the included weather Emojis each day. ★ Today is / Tomorrow will be / Yesterday Was daily display. ★ 4 large Emoji accent pieces for decoration. Every piece in each set - including the editable versions - is availalbe in 3 styles: white background with black border and yellow border and black background with yellow border. 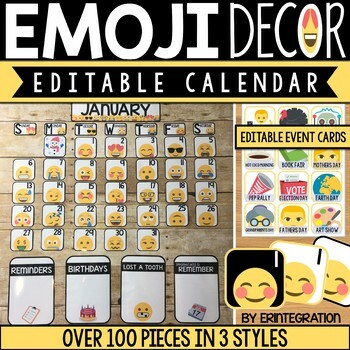 BUY EMOJI DECOR BUNDLE AND SAVE.